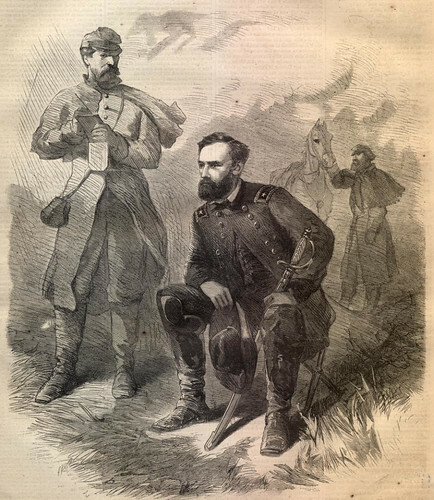 Sherman, having finally heard from Grant after the fall of Richmond, repeats his plans in detail. He will pursue Johnston, with Grant pursuing Lee, hoping to push them together and corner them. In the Field, Goldsborough, N. C., Saturday, April 8, 1865. GENERAL: I have just received your letter of the 5th from Wilson’s Station, and although I have written you several letters lately, will repeat. On Monday at daylight all my army will move straight on Joe Johnston, supposed to be between me and Raleigh, and I will follow him wherever he may go. If he retreats on Danville to make junction with Lee I will do the same, though I may take a course round him, bending toward Greensborough for the purpose of turning him north. I will bear in mind your plan and unmistakable point that “the rebel armies are now the strategic points to strike at.” I will follow Johnston, presuming that you are after Lee, or all that you have left to him and if they come together we will also. I think I will be at Raleigh on Thursday, the 13th, and shall pursue Johnston toward Greensborough unless it be manifest that he has gone toward Danville. I shall encourage him to come to bay or to move toward Danville, as I don’t want to race all the way back through South Carolina and Georgia. It is to our interest to let Lee and Johnston come together, just as a billiard player would nurse the balls when he has them in a nice place. I am delighted and amazed at the result of your move to the south of Petersburg, and Lee has lost in one day the reputation of three years, and you have established a reputation for perseverance and pluck that would make Wellington jump our of his coffin. I wish you could have waited a few days, or that I could have been here a week sooner, but it is not too late year, and you may rely with absolute certainty that I will be after Johnston with about 80,000 men, provided for twenty full days, which will last me forty, and I will leave a small force here at Goldsborough and repair the railroad up to Raleigh. If you have a spare division you might send it to Schofield to help him hold this line of railroad out from Morehead City to Goldsborough, but I will not hesitate to let go the railroad and everything if I can get at Joe Johnston in an open field. If Sheridan don’t run his horses off their legs and you can spare him for a week or so let him feel down for me, and make a big haul of horses. Tell him I make him a free gift of all the blooded stock of North Carolina, including Wade Hampton, whose pedigree and stud are of high repute. Don’t fail to have Stoneman break through the mountains of West North Carolina. He will find plenty of Union men, who will aid him to reach either your army or mine, and Canby should, if he takes Mobile, get up the Alabama River about Selma, from which place he can catch all fragments passing toward Texas. I have an idea that he can get up the Alabama River, even if he do not take Mobile. I have a report from Wilson, who will, I think break up all railroad lines in Alabama. This entry was posted in George Stoneman, Georgia, Joseph Johnston, North Carolina, Philip Sheridan, Robert E. Lee, Sherman's March, South Carolina, Ulysses S. Grant, Virginia, Wade Hampton, West Virginia, William Tecumseh Sherman. Bookmark the permalink.